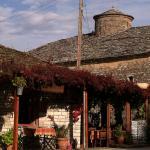 We finished the Vikos Gorge hike at Vikos village, and were really happy to find this restaurant about 200 meters from the end of the trail, right by the village church. The food was local, fresh and delicious. The owner very welcoming, and also gave us a taxi service back to Monodendri, where we left our car. Been to Restaurant H Tsoumanis? Share your experiences!